Lang repair parts kit. Fits TU-443, TU-446, TU447, TU-448, TU-480A, and TU-485A. Lang 100 PSI gauge. Fits TU-540 and TU-550. Lang release valve tubing hose assembly. Fits TU-540 and TU-550. Lang M12-1.00 Honda Pulse Dampener Adapter. Fits TU-550, TU-443-2, TU-443-3, and TU-540-1. Lang Banjo Bolt M6- 1.0 With O-Ring. Fits TU-443, TU-480A, TU-485A, TU-550, and TU-540-1. Lang Banjo Bolt M8-1.0 with Nylotron Washer. Fits TU-443, TU-480A, TU-485A, TU 540, and TU-550. Lang Banjo Bolt M10-1.0 with Nylotron Washer. Fits TU-443, TU-480A, TU-485A, TU-550, and TU-540-1. Lang Banjo Bolt M12-1.25 With Nylotron Washer. Fits TU-443, TU-480A, TU-485A, TU-550, and TU-540-1. Lang banjo bolt M12-1.50 with Nylotron Washer. Fits TU-443, TU-480A, TU-485A, TU 540, and TU-550. Lang 100 Psi Gauge Hose and Relief Valve. Fits TU-443, TU-469, and TU-480A. Lang 2-1/2'' (100 Psi) gauge and hose. Fits TU-447 and TU-448. Lang 2-1/2'' (60 Psi) gauge and hose. Fits TU-446. Lang Bosch CIS upgrade kit. Contains: 71408 and 71409. Lang upgrade kit (Except CIS/TBI). Contains: TBI): 71308, 71313, 71314, 71318, 71319 and 71327. Lang relief valve and tubing assembly. Lang OTC Conversion, Use Adapters with OTC Canister. Lang Tubing Kit 3/8''. Tube with inverted flare nuts, hose clamps, and straight tubing. Fits TU-443, TU-446, TU-480A, TU-540, TU-550, and TU-540-2. Lang quick coupler socket by male standard Schrader. Lang M14-1.50 banjo bolt (for CIS). Fits TU-540, TU-550, TU-443-2, and TU-443-3. Lang 6-Foot. Road Tester Hose. 6 extension hose works with any Lang fuel injection testers with quick connects. Lang 5/16'' quick disconnect hose assembly with quick coupler plug: Chrysler/ Ford. Fits TU-485A, TU-540, TU-550, 74489, TU-443-2. Lang 3/8'' quick disconnect hose assembly with quick coupler plug: GM. Fits TU-485A, TU-540, TU-550, 74489, TU-443-2. Lang GSI conversion, use GSI adapters with star canister. 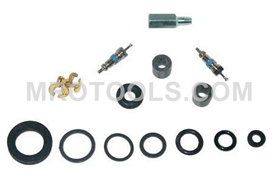 Lang Fuel Injection Update Kit I. Constists of right angle adapters for Ford, GM, etc; deadhead pressure check adapter and quick connects for Chrysler, GM etc. The 74437 Lang Repair Parts Kit is one of thousands of quality tooling products available from MRO Tools. Please browse Lang Gas - Petrol Fuel Injection Pressure Testing Equipment for tools similar to the 74437 Lang Repair Parts Kit. 74437 Lang Repair Parts Kit description summary: Lang repair parts kit. Fits TU-443, TU-446, TU447, TU-448, TU-480A, and TU-485A. Quantity discounts may be available for the 74437 Lang Repair Parts Kit. Please contact MRO Tools for details.